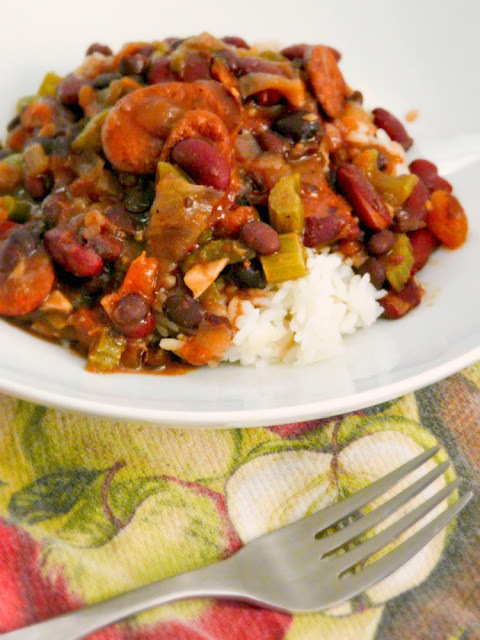 Since I love Southern food, I decided to make a Creole stew with some of the beans in my cupboard. 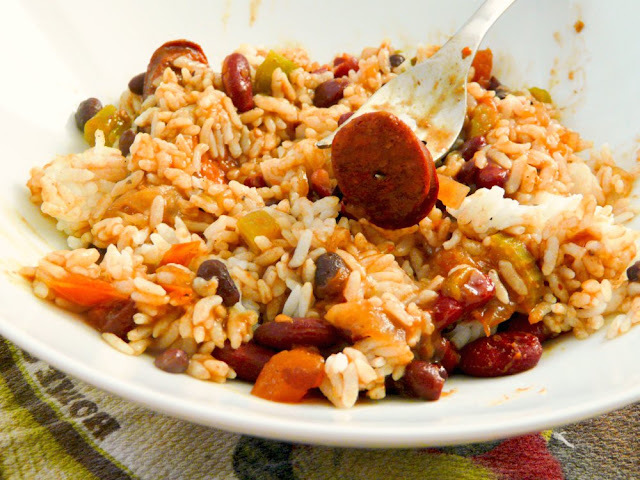 Creole food is very similar to Cajun food but is distinctive due to having more Spanish & Portuguese influences while Cajun food derived its cooking style from the French. 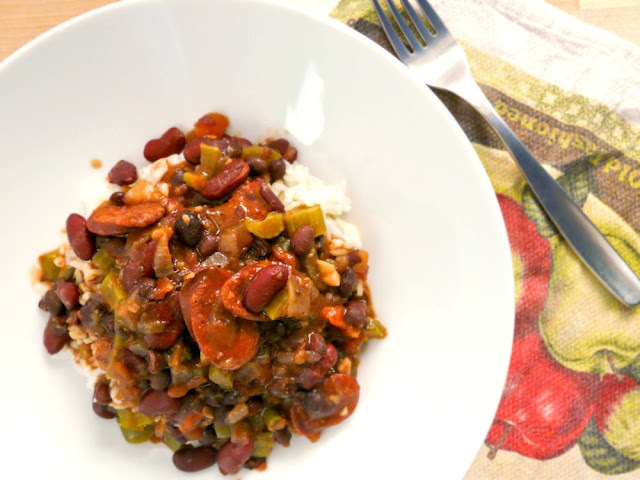 You'll see beans and tomatoes being widely used in Creole food and rice is usually a very important component of a meal...perfect for a rice addict like me! Even though I made this dish in the slow cooker, you can also simmer it on the stove top on low heat for a couple of hours, stirring it every so often until the vegetables are soft and tender. Best served with rice but could also be accompanied nicely by some good bread or cornbread. Add the chopped celery, green pepper, tomatoes, black beans and kidney beans to the crock pot. Slice up the sausages and pan fry on high heat until browned. Transfer them to the crock pot. Using the same pan, saute the onions and garlic together. You may need to add a little oil at this point, depending on how much fat was rendered from the sausages. When the onions have caramelized, de-glaze the pan with the beer and scrape off any brown bits left on the bottom. Transfer the onions and garlic to the crock pot as well. Add the bay leaves and spice seasoning to the crock pot then give everything a good stir to mix it all up. Cover and set the slow cooker on low. Cook for 6 hours. Don't worry if it may seem like there's not enough liquid in the pot. Over the span of 6 hours, the vegetables will render alot of liquid when they soften. Add salt to taste before serving. Allowing it to cool for about 15 minutes will yield a thicker stew. If you end up having too much liquid, you can thicken it with 2 tablespoons of cornstarch mixed with 1 tablespoon of water.